Shazam! is the first comic book movie in a while to lean full tilt into its source material’s cheesiness. While Sam Raimi’s Spider-Man trilogy has been noted for its campiness, it has nothing on Shazam!. This isn’t bad, in fact it’s great, and it is just what the DCEU needs. Continuing on the success of Aquaman, the DCEU is actually in a good place for once. You’ll laugh, you’ll cr- actually, no, you’ll pretty much just laugh. While the movie lacks the grounded-ness and stakes of a modern superhero film, it finds its own niche and relishes in its own uniqueness. Billy Batson (Angel) is an orphan. After running away from another foster home in search of his birth mother, Billy is taken into the home of Victor (Andrews) and Rosa Vazquez (Milans). There Billy is introduced to other foster siblings, including Freddy (Grazer), who is obsessed with superheroes. When the villainous Dr. Sivana (Strong) gains a monstrous power, Billy is chosen by the Wizard Shazam (Hounsou) to be his champion. With new powers and a new look (Levi), Billy struggles with the burdens of responsibility and family. Shazam! stands out from most comic book films in the sense that Billy’s powers are actually a burden. He doesn’t get a training montage to master being a superhero. Even when he begins to understand his powers, they are more trouble than they’re worth. This film really nails the gravity of what suddenly having superpowers would do to anyone, let alone a fourteen-year-old kid. The hero Shazam falls down. He runs too fast, shoots lightning too far, and he can’t figure out how to change out of his tights. Even as the film draws to its climax, Billy struggles with the immense strengths that he is given, and it leads to a climactic battle with actual stakes. In a world where Superman is pretty much invincible, it’s nice to focus on a hero that feels getting punched and bleeds when he’s struck in the face. Shazam! ups the ante by lowering the hero. While Shazam is pretty much invincible to a normal human, he faces enemies that actually come across as a physical challenge. Adding to this, Billy Batson is a protagonist way over his head. He gets scared, he runs, and he hides. In other words, he feels real and is much more relatable as a person. This is a much needed step for the DCEU which has overall struggled to relate its characters to its audiences. This is the first DCEU film, in my opinion, to feel unburdened by Zach Snyder. While I enjoy some of the directors works, the DCEU has struggled under the weight of the grim tone he set in Man of Steel. 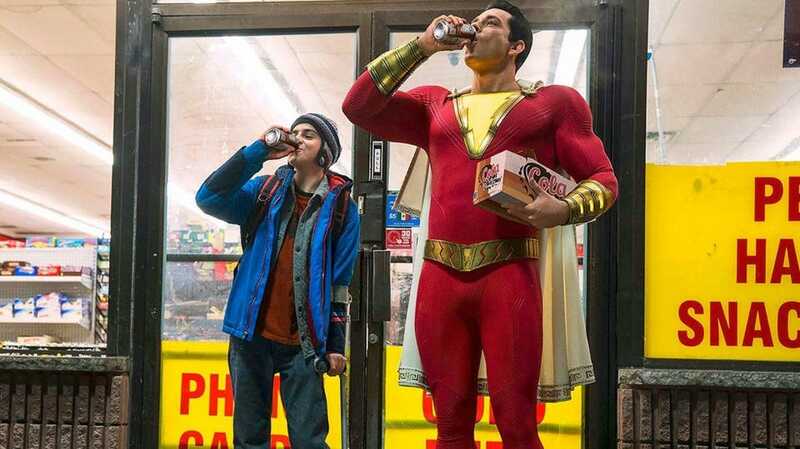 Shazam, not having been a part of the Justice League story line, is unburdened by having to match pace with the other characters and their worlds. Instead, David F. Sandberg creates a character who is fun and real. In addition, he creates a movie that is tonally unlike anything else in the DCEU. Shazam! is bright and colorful. It is also fun, lighthearted and quippy. Shazam! abandons all notions of seriousness that plagued Aquaman and just has fun being a superhero movie. In this way, the film stands out not just from the DCEU but from its MCU contemporaries. This film feels like the first in the series to have a genuine soul. It’s an experiment in the DC canon rather than being a mere extension of a shared universe. 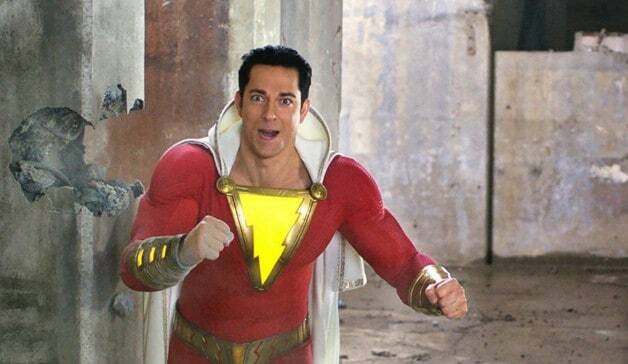 While all of the actors seem to be having fun, none are as visibly excited about Shazam! as Zachary Levi. Granted, Zachary Levi appears to be having fun with all of his roles. The actor charmed me first in Chuck and even in his minimal role as Fandruil in the latter two Thor films. However, Levi is having the time of his life in Shazam’s spandex. Zachary Levi plays the best child in a man’s body since Tom Hanks in Big. While there isn’t much competition in this regard, Levi brings charm and charisma aplenty to Shazam! His performance heightens the film’s cheesiness, but also brings a surprising amount of gravity to the dual role. He compliments Billy Batson actor Asher Angel very well. The two switch seamlessly between roles and compliment each other’s performances in the perfect pairing. Despite all of its fun and frivolity, Shazam! could do with a little more nuance. The film’s overall themes of family, responsibility, and facing our past pains are all preached a little too loudly. The most obvious example of this comes in the form of The Seven Deadly Sins, the spiritual allies of Dr. Sivana. As one might guess, these sins are exactly the same as they are in the Catholic canon. While I appreciate the villain’s flaws and reasoning being explored, I can do without Shazam yelling the name of Sivana’s deadly sin of choice directly at the villain. In addition, Billy’s personal arc with his birth mother and foster family are walked through ad nauseam. The fact that Billy is an orphan doesn’t need to be re-explained to the audience every few minutes. At several key emotional points in the film, the characters exposit what the audience already knows, slowing down the overall pacing of the film. This hurts the film, as it lacks the emotional complexity of recent superhero achievements such as Wonder Woman and Black Panther. However cheesy the emotional message may be, it is at least heartfelt and pertinent, managing sticking the landing resoundingly. Mark Strong’s Dr. Sivana gets a lot of screen time for this film serving as Shazam’s origin story. The film does simplify the origins of the rivals by tying them together, but Sivana gets enough of his own story to truly stand out. However, he also falls victim to the film’s need to over explain everything, taking away some of the villain’s nuance and mystique. Taking these developmental issues into account, Mark Strong does a fantastic job at bringing a rather straight forward character to life. Strong plays the villain to be powerful, fearsome, and compelling. His presence on screen is truly felt and he gives the protagonist a run for his money, something that often feels amiss in a typical origin story. Given that his tenure as Sinestro was cut incredibly short, it’s nice to see the actor get his due with Dr. Sivana. Shazam! is a fun superhero movie. It’s nothing profound or thematically groundbreaking, but it’s a much-needed breath of fresh air in the DCEU canon. The film is on the nose, yet heartwarming and sincere. Hopefully DC learns from this and start experimenting more with fun and lightheartedness. Thank you for reading! What are your thoughts on Shazam!? Comment down below!